Discussion in 'Off Topic' started by KTMDirtFace, Sep 26, 2017. Well I just ordered a kit. Been eyeballing them for awhile glad I waited for v3. danzca6, WheresWaldo, mark tomlinson and 1 other person like this. I hate your excess income. danzca6 and Geof like this. There are a lot of nice features on that printer, if I was just starting out, that would be high up or even at the top of my list. Did you see the pic of the control board itself? Screw terminals for the power inputs (and the heated bed input/output) that are identical to the ones used on the PSU, no more goofy plastic connectors. I have to sell some stuff now to make room. Geof and KTMDirtFace like this. While I could make room. I just wont use more than one maybe two printers. I already have 2...one at least has to go. I hate having things in my house or shop that i never use. Hoping someone at work wants it. So I don't have to deal with shipping. In the 3dPrinting nerd interview, they mention soldering something to attach a Pi-Zero..but then its integrated into the machine. Going to have to get a pi-zero and figure that out too. Even if I don't no reason I can't just hook a regular pi up via USB.. but would be nice to have it integrated and not have 2 power cords and all that. I'm bringing the mini into work tomorrow. 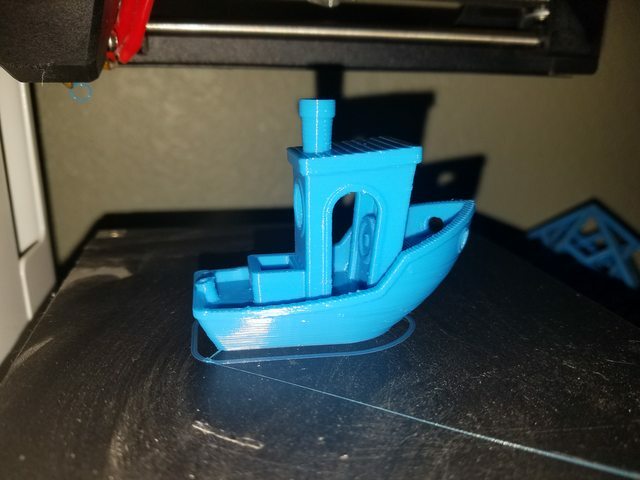 Just cleared the mem card and put a benchy on it.. printed. 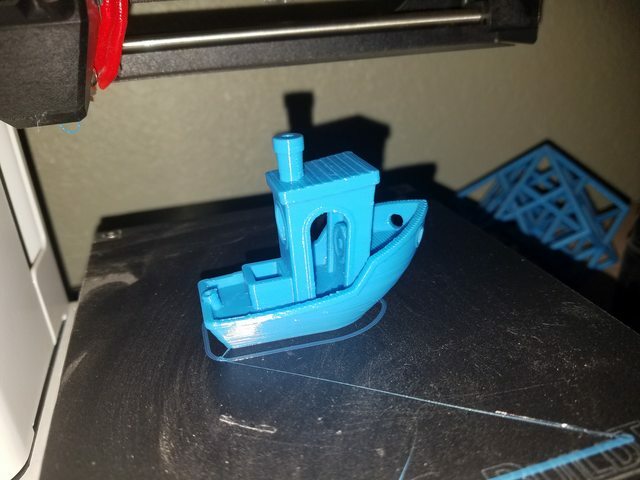 it does good, this is with the robo3d blue pla mini spool that came with one of my robo's ages ago. I am not a fan of the rPi Zero, it is under-powered if you use WiFi and there is no ethernet port. I am still a fan of the reliability and speed of a wired connection. Its not like a Prusa is a portable printer. The way it is integrated into the board makes adding a touchscreen impossible, so all you really get is the web interface. I'm too claustrophobic to go under my double wide to hardwire things lol. So I generally use wifi. I really like the octoprint web interface its all I use on my Robo R1 anyway..even though it is sitting right next to my PC. 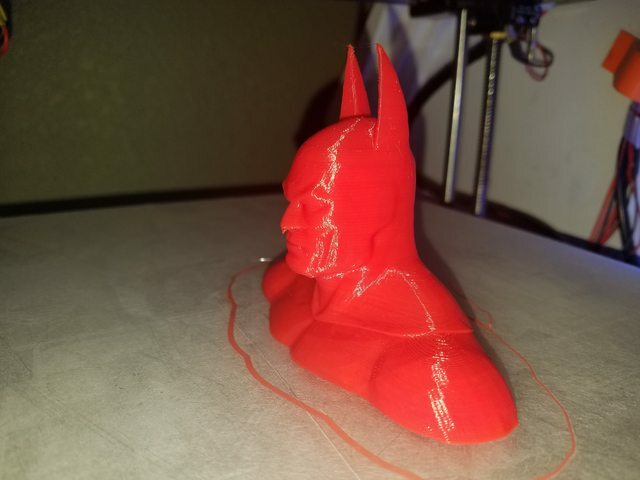 It only need the connection to upload the file and start the print after that..doesn't matter anyway right? Meanwhile while I wait for November? or whenever the MK3 comes.. Fired up the modded out R1 covered in dust..still doing great. Geof, Waldo, STILL not on Mesh HA HA. Geof and mark tomlinson like this.